Prepare a white card base 5 x 7" and layer it with a piece of the Tulip Time paper 1/4 inch smaller. Add 3 Crystal Drops in the upper right hand corner. Instructions: Cut one of the Frame A card 1/4 circle from white cardstock adhere to the left side of the card. Cut a piece of white cardstock 2 x 6" and layer it with a piece of the Tulip Time paper, adhere to card. Cut one of the Eyelet Rectangles out of white cardstock and layer it with a piece of the Tulip Time paper, adhere to card as shown. Stamp the Tulip Bouquet on white with Library Green, color in with the pencils. 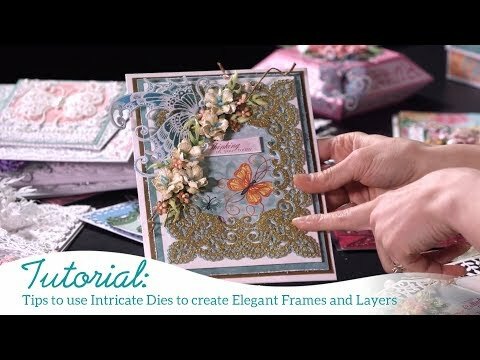 Stamp the Watering can on white with the Coffee ink, color in with the pencil, cut everything out with the coordinating die, add the bouquet to the back of the watering can, add foam dots and adhere to card. Cut one of the smallest arrows out and adhere under the watering can. To finish add glitter to the flowers and leaves.